By Dan Crain; Community Facilitator in the South Atlanta neighborhood in Atlanta, GA.
Friday night, March 24th, 2017 will be forever etched in my memory. It was the night my mom went into the hospital and spent two days in a coma. It shook our family to the core at the thought of what would happen to mom. I woke up Saturday morning unsure as to whether I would fly out that day to go see mom and possibly say goodbye? My older brother Steve told me to wait as mom was in stable condition and I had a very important speaking opportunity coming up in a few days in Atlanta with Desire Street Ministries. I told my wife Adrienne that I needed to go on a run and so I set out through the neighborhood. I made it to Carver Homes and distinctly remember the Spirit telling me to go see Larry. Larry is our friend that we’ve been getting to know ever since we moved to the neighborhood six years ago. Larry has also been homeless for about twenty years. Our kids don’t know Larry as a homeless person. They know Larry as a friend and neighbor who happens to be homeless. One of the hardest parts of being away from family during that time is that I wasn’t able to be there with them, particularly for my dad. One of the core reasons of wanting to go and see Larry is that he and my dad look very similar. They have beards, baldheads and deep blue eyes. 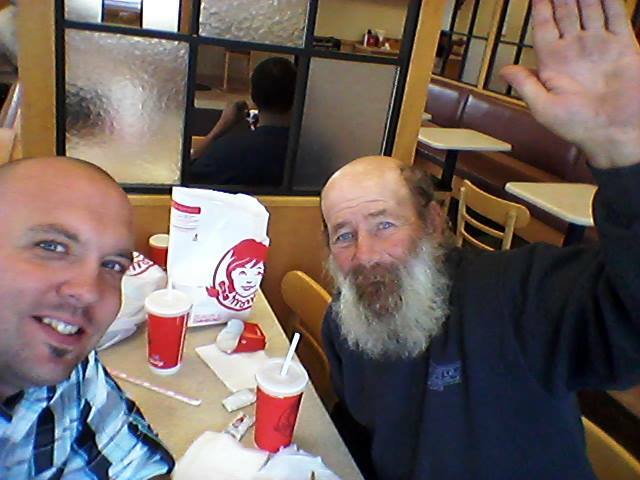 Whenever I am missing the presence of my dad, I will go and track Larry down and eat lunch with him at Wendy’s. This is what’s happening in the picture above. So, I turned down Pryor Road in search of Larry. I found him in his spot behind Napa Auto Parts hanging with his friends. I approached him and we exchanged greetings, as we hadn’t seen each other in a couple of weeks. I told him what was going on with mom and in the kindest possible way he looks at me and says, “Well you know what we’ve got going for us Dan? You’re mom is saved and knows Jesus”. I thanked him for those words and asked him if he wouldn’t mind praying for my mom, dad, family and myself. He agreed and so Larry and his friends placed their hands on my back and prayed over me as I leaned against the wall and wept like a baby. We’ve been comforted by the body of Christ during this time, but in that moment something special happened. I realized it’s one thing to receive comfort from others, it’s quite another to receive comfort from friends that literally live in the valley of shadow of death. Living on the streets is hard. What kind of comfort did I receive from Larry that was so well, comforting? It was that Christ has been present as a brother to Larry in the direst of circumstances and in the most destitute of places. Christ is with him in a way that he’s never been with me and so I experienced Christ’s presence in that moment through him. I am a white, middle class man with enormous amounts of privilege and access to resources and people that Larry could only dream of. I have all the things in my life that give me the allusion of control. Larry has none of those things that I take for granted and so to be comforted by him was truly humbling, life giving and a change in perspective. 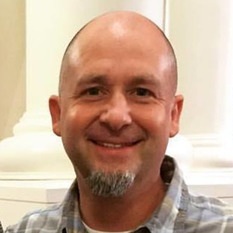 There’s a verse in Romans 1 that frames what I experienced from Larry in that moment; “For I long to visit you so I can bring you some spiritual gift that will help you grow strong in the Lord. When we get together, I want to encourage you in your faith, but I also want to be encouraged by yours.” There have been moments where I’ve showed up and encouraged Larry to keep going. But as a minister of the gospel, I fully believe in the concept of dignified interdependent relationships with those on the margins from Dignity Serves. Larry has a gift of empathy and I was comforted by that gift. Larry told me one time that he gave his last few dollars to another friend living on the streets just so he could get something to eat. Gerald Sittser writes in “A Grace Disguised: How the soul Grows through Loss”; “One learns the pain of others by suffering one’s own pain, by turning inside oneself, by finding one’s own soul…” Larry has suffered his own pain and thereby was able to learn my pain in that moment. Since that moment back in March my mom has passed away and Larry is back home with his family. It’s strange how death and resurrection can live so close to each other? Larry connected with a ministry here in the city that reunites family members with people that are chronically homeless and so they came down a few months ago to get him. I would be lying if I didn’t acknowledge that my soul doesn’t miss my friend, because it does. I went to go find him a month ago on my mom’s birthday, November 6th but he had already left for home. Everyone has something to give. It doesn’t matter where they are or what state of life they are in. If you are serving those on the margins, ask different question rather than what do you need? What do they think about your ministry? Can they speak into your life? Can we grab a bit to eat together? Jesus is with those on the margins in a special kind of way and I want to be there to be comforted by the comfort they receive from Christ. According to Matthew 25, a fruit of our salvation is dependent upon that.